Greenery has a positive effect on the mind. A feeling of relaxation sets in when you work out outdoors. It soothes you completely and you are able to learn and grasp things better. You get the required exposure to sunlight and air. Fresh air helps you inhale a good amount of oxygen. 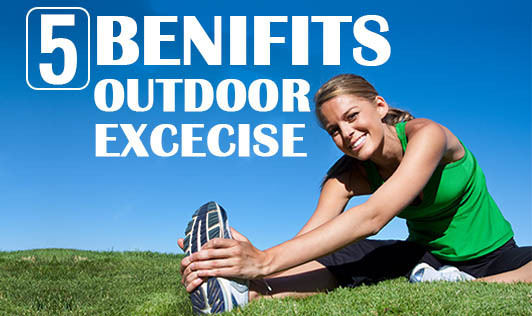 Sunlight gets you Vitamin D. So, working out outdoors is certainly going to make you healthier. Working out outside guarantees a boost in energy. You are likely to repeat the outdoor activity more often because of the experience you get out of exercising in open spaces. Outdoor exercises ensure better brain health. Cardio, especially walking, is reported to have an enhanced effect on the brain cells due to improved oxygen absorption. Outdoor exercises are great mood enhancers. Moreover, when you work out in public parks, it provides good scope for meeting new people and sharing ideas. An element of socializing added to the activity of working out can surely produce a positive effect on your mood and behavior. So, due to any reason if you are not able to make it to the gym, do not feel disheartened. Switch to outdoor exercises and you can meet your fitness goals without any hindrance.